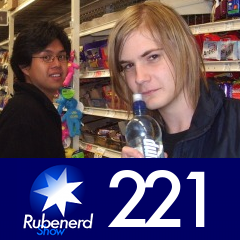 45:00 – Ruben's sexuality (don't take that the wrong way), changes to the programme, listener feedback on the Rubenerd Forum (Dave on Plunger coffee, Manny the Mailman's huge wallet), signs you are too dependent on your laptop, podcast review (Anything but Monday by Frank Nora and Mad Mike), Chinese high school girls, sinking plastic deodorant containers, irritating time zone differences, insane stalling downloads, power(point) struggles at Starbucks, dorky high school codenames, guys with long hair, exam halls next to gyms, John C. Dvorak gets no spam, and a row of cards that go to Jupiter! Recorded in . Licence for this track: Creative Commons Attribution-ShareAlike 3.0. Attribution: Ruben Schade. Older post → FreeBSD guy tries and likes Slackware Linux!